If you collected comic books in the 1990’s, you probably remember all the fancy covers we were treated to in that era. Heck, I still have my copies of each issue from X-Men’s “Fatal Attractions” story arc with the holograms on the front covers. In recent years, major publishers have recaptured this magic, including DC with Death of the Family getting the die-cut treatment. And, as it turns out, more bedazzling is on the horizon with Dark Days. You see, DC co-publisher and legendary artist Jim Lee recently took to Instragram revealing that his cover for Dark Days: The Forge #1 will, in fact, be metallic foil. Seeing as how this will be the first of two one-shots leading into Scott Snyder and Greg Capullo’s Dark Nights: Metal event, we can’t help but wonder if this trend will continue with subsequent installments. After all, it would make sense to go in this direction. Our hope, however, is that it doesn’t affect the price point all that much. Dark Days: The Forge #1 is scheduled to arrive in comic shops on June 14. My cover for DARK DAYS: THE FORGE–one of two prelude books which sets up the big DC summer event entitled DARK NIGHTS: METAL by @ssnyder1835 and @real_greg_capullo. 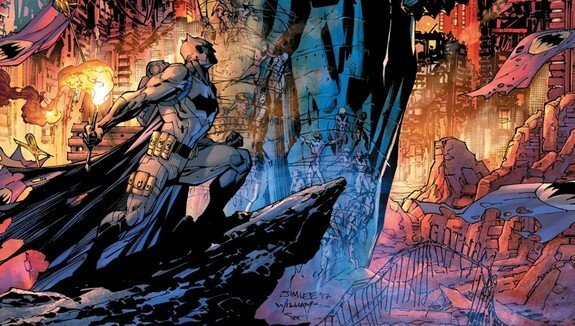 Dark Days: the Forge and DARK DAYS: THE CASTING are out in June and July! I'm doing the art for both prelude books with @andykubert and @joromjr. The Dark Days titles written by @ssnyder1835 and @jamesthefourth!